The question which looks better is always personal, but with the Ambit 3 you have at least four options in colors, where the Polar is available in black and blue. Both watches support bluetooth sensors, Suunto swapped from ANT+ to bluetooth since the Ambit 2. So if you’re upgrading from an earlier version, keep in mind that your cadence, power heart rate and other sensors may not be compatible. Maybe a miss from Suunto to switch sides, maybe a safe bet considering all the new companies coming out with cheaper, more versatile, and ‘open’ sensors. With open I mean sensors like the Tickr X from Wahoo Fitness which actually has an API to allow other developers to better integrate or support the sensor. This is important as, from what I gathered, Garmin has it’s own methods of sending some data (like vertical oscillation and ground contact time) over ANT+ and doesn’t allow other members of the ANT+ Alliance (including Suunto!) to use this. So an open protocol is good, now let’s hope for a standard and firmware updates all around. Where weight isn’t a factor I would count in when buying either of these, the Ambit is seven grams heavier than the V800: 86g vs. 79g. Battery wise, the polar lasts about 50 hours and Suunto stops after 25 hours, however, if you upgrade to the Peak you get 50 hours of battery life too. Both watches can syncronize your activities using your phone’s internet connection and Bluetooth 4.0. When paired, the Suunto also has phone notifications of texts, calls etc. 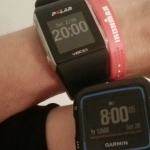 For your pool sessions, both watches support nearly identical metrics, they can both record heart rate, stroke type, swolf, stroke count, pace, etc. And you can set the pool length to match where you are. The difference here is that the Suunto supports an drills-mode, however, I wouldn’t be surprised if Polar adds this with a firmware update as it has added all the swimming features in November 2014. 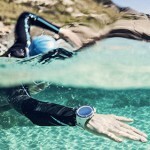 For open water swimming, the Suunto is ready too, but Polar plans to release the open water metrics via another firmware update in March 2015. If water resistance is of importance to you, the Polar has a 30meter vs. 50 on the Suunto (and a 100m for the Peak). Not much to say about the bike here, both watches can give the same metrics and support cadence, heart rate and power sensors. Similar to cycling, the watches are nearly identical, both support heart rate and give you the expected metrics you want to see. For your running cadence, the Ambit 3 can derive this from your arm movement. But neither give the data for vertical oscillation nor ground contact time which you can see on the Garmin 920XT. The Suunto has no race predictor. 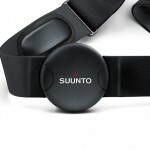 If you like to set out in an unknown area and follow a gps track, you can do so with the Suunto. Create a track on your computer and upload it to your phone. Polar has similar features, however you can only use pre-made tracks, and thus not something made by yourself or a friend’s past track. If you’re interested in the outside temperature, Polar actually records it in the V800, Suunto’s Ambit 3 only supports this in the Peak edition. I list and update price from different stores, giving you the cheapest option, depending on where you’re visiting from. I generally advise to buy watches with their HRM’s, as usually a bundle pack is cheaper than buying separately. And for these watches, to record heart rate while swimming, you need the bundled HRM strap (unless you already have that exact one). I always enjoy your articles. Thank you. Just real quick though, is the pricing right on the Polar? When I click the link, looks like the version without the HRM is actually $382. Thanks! My prices could be off by a day or two, I have a system where I can update them and I do so for several countries. Could also be I made a typo! Which watch did you check? Hi, thanks for the comparison… just what I needed. Do you have any extended details on the “everyday” metrics for both? Things like number of steps, rest time and alerts for drinking/walking/resting. Sadly, not really. I know the V800 tracks steps, distance and calories and paired with the app it can give you full insight (e.g. the exact count, sleep time, etc.) and the Suunto is said to count steps, but it is said it’s doing it somewhat poorly, and as far as I can recall (also did a quick search) it doesn’t track sleep, which would actually be the more interesting one in my opinion (sleep time that is). But since I currently don’t have either watches at hand I can’t give you an in depth comparison there. And this info is from what I remember. Both watches can give you a recovery time. Thanks for the comparison! Noted one detail though on the navigation part under ‘Miscellaneous’. 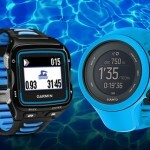 The V800 and Suunto should be the other way around. V800 has limited navigation (pre-made tracks or back to start). Suunto supports creation of custom tracks etc. Ah Thanks! Missed that, corrected. It’s a bit confusing sometimes. The watches have so much overlap in features I occasionally mix them up. Hi, what about the display? Isnt the polar clearer and larger? Does it show 4 parametrs on each screen with large figures? Unfortunately, I have neither watches at hand today. But I can tell you this: The Polar can show 4 fields at once and has great readability of the display. See my full review of the V800. One of the first pictures is on a bright day on a white table and in the ‘online’ paragraph you can find the display setup. The watch can show from 1 to 4 metrics on a display and can have up to 8 different displays for a given sport. You can choose what ever you want to see on a display and mix the metrics you want. You choose the order of the screens and the order of the metrics on each screen. I will not detail all the metrics for there are too many and depend on if you have the accessories and the type of sport. The watch can also hold up to 20 different sport profiles (afaik). Are you satisfied with V800 so far? Up to now, yes, I am. As with all electronic devices that get more and more features, there’s always little glitches here and there from time to time but Polar seems to be very active in correcting them. On the sports side there’s nothing to say against the watch. As for the smart notifications, I disabled them because it drains the battery faster and some applications on the phone are stupid. I also see Polar has added metrics recently and is working on integration with GoPro (V800 only).